rooted in the radical: fr. jack morris, s.j. and brother fred mercy, s.j. Brother Fred Mercy, S.J. and Father Jack Morris, S.J. 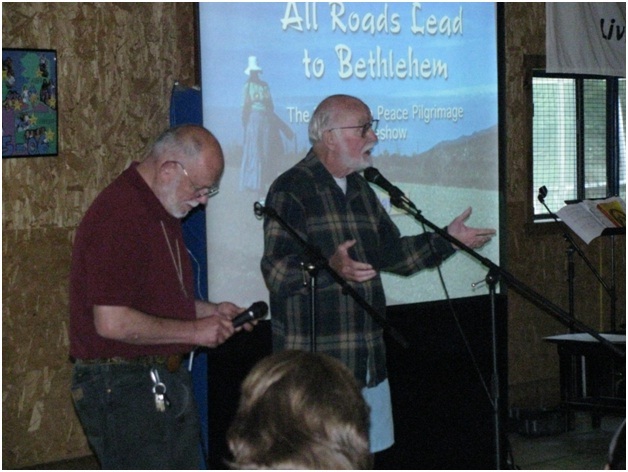 sharing their experience of the Peace Pilgrimage to Bethlehem at JVC Northwest Orientation in 2011. Father Jack Morris, S.J. was instrumental in the founding of JVC Northwest and has been an integral part of the JVC Northwest community and history for the past 56 years. With Father Jack Morris, S.J. and Brother Fred Mercy, S.J. now residing in Spokane, Washington, journalist Shawn Vestal was able to interview them and gather their thoughts on their Peace Pilgrimage to Bethlehem 30 years ago. Thoughts on rooted in the radical: fr. jack morris, s.j. and brother fred mercy, s.j. Hard to believe the Bethlehem Peace Pilgrimage was 30 years ago. I worked with Br. Mercy @ Central Seattle Chore Services in 1980. I remember the planning meetings and the dedication of all involved. I did not walk but knew many that did. I found it truly amazing. My best to Fr. Jack Morris and Brother Fred Mercy. Susan McDonough, Seattle 80-81. It’s hard to believe that Bethlehem Peace Farm was that long ago. I’ve been wondering about you guys and would love to hear from you. Fred and Jack would you give me your address, or will you be in Portland anytime, soon. I would love to see you. Hi Gary, thank you for taking the time to reach out about Fred and Jack. Jack passed away in a few years ago and Fred transitioned to the Jesuit retirement facility in Los Gatos, CA earlier this summer. We can help you reach out to Fred if you’d like, simply email our Outreach and Events Coordinator, Zach, at outreach@jvcnorthwest.org. We look forward to hearing from you and hope all is well with you.